Addison's disease occurs in all age groups and affects both sexes. Addison's disease can be life-threatening. Cortisol helps the body respond to stress, including the stress of illness, injury, or surgery. It also helps maintain blood pressure, heart function, the immune system, and blood glucose (sugar) levels. Aldosterone affects the balance of sodium and potassium in the blood, which in turn controls the amount of fluid the kidneys remove as urine, which affects blood volume and blood pressure. 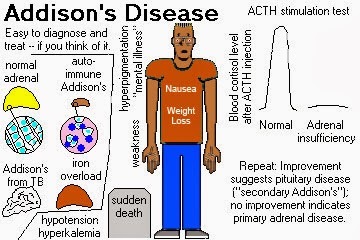 Addison’s disease is also called “primary adrenal insufficiency.” A related disorder, “secondary adrenal insufficiency,” occurs when the pituitary, a small gland at the base of the brain, does not secrete enough adrenocorticotropic hormone (ACTH), which activates the adrenal glands to produce cortisol. What causes and rick factors of Addison’s disease? 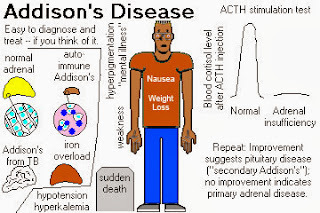 Addison’s disease is caused by an autoimmune response, which occurs when the body’s immune system (which protects it from infection) assaults its own organs and tissues. With Addison’s disease, the immune system attacks the outer portion of the adrenal glands (the cortex), where cortisol and aldosterone are made. Your doctor can help determine whether Addison's disease or some other medical condition may be causing these problems. History and physical – Your doctor will review your symptoms and perform a physical exam. Dark patches on your skin might be a clue for your doctor to consider testing for Addison’s disease. X-rays, ultrasounds and CAT scans of the abdominal region to check for visual signs of damage and the size of adrenal glands. Computed tomography (CT scan) – Computed tomography uses computers to combine many X-ray images into cross-sectional views. A CT scan might be done to evaluate the adrenals and/or pituitary gland. For example, it can show if the immune system has damaged the adrenal glands or if the glands are infected. Corticosteroid injections. If you're ill with vomiting and can't retain oral medications, injections may be needed. An ample amount of sodium is recommended, especially during heavy exercise, when the weather is hot, or if you have gastrointestinal upsets, such as diarrhea. Your doctor will also suggest a temporary increase in your dosage if you're facing a stressful situation, such as an operation, an infection or a minor illness. Addison's disease itself can't be prevented. However, it's possible to prevent Addisonian crises, or medical emergencies caused by untreated Addison's disease. Identify cancer symptoms to prevent spread of cells into adrenal glands and bloodstream. By taking prescribed medications every day and increasing dosage during times of stress or illness, Addison's disease can be kept under control. If you think you are at risk, talk to your doctor. What is the outlook for people with Addison’s disease? People who have Addison’s disease will need to take medicine for the rest of their lives and can live normal healthy lives. If you have Addison’s disease, you should carry an identification card and wear a bracelet at all times to let medical personnel know you have the disease. Always have extra medicine on hand in case you become ill and need more. Ask your doctor about keeping a shot of cortisol for emergencies, and be sure someone with you knows how to give you the shot.